From peaceful patio retreats to dramatic flowerbed spreads, creating a beautiful garden landscape design is all about the planning. Here are five quick tips to help you lay the groundwork for your next project. Even the greenest thumb needs to take the local climate into account when choosing what to grow. Make sure to select plants with irrigation and temperature requirements that align with your region’s weather patterns. Native species are often a great choice, since they are already perfectly acclimated to local seasonal changes. While some plants thrive in dense clay, others prefer loose, sandy soil. Before planting, make sure to understand the drainage needs of the species you choose. Since plants also often have a strong preference for alkaline or acidic soil, it’s also a good idea to have the soil tested. If needed, amendments like lime, sphagnum peat or sulfur can help you achieve the right pH balance for your plantings. Flowering perennials typically bloom for about a month during the growing season. 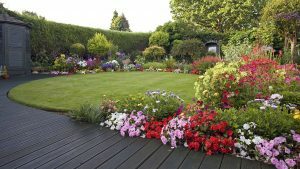 To make sure that your landscape design incorporates color throughout the spring and summer, make sure to combine plants that flower at different times of year. Choosing plants of different heights, shape and texture creates visual interest and adds welcome variety to your space. A simple approach is to arrange plants in ascending order of height, from short blooms like petunia or impatiens to taller ones like sunflowers or calla lilies. Building pathways, retaining walls and other hardscaping features can help to frame the contours of your garden spaces and give you better all-season access. Retaining walls can also be used to make raised planting beds that provide excellent drainage. Whether you know exactly what you’d like or you’re still looking for inspiration, a full-service landscaping company is a great place to start. In addition to providing horticultural advice on choosing and caring for plantings, many businesses offer design consultations and hardscaping installation to transform your yard from boring to blissful.